At Rock Pharmacy, we believe our mission is to serve Christ and the world through pharmacy. We have a moral and legal fiduciary responsibility to follow Biblical principles, including the sanctity of life beginning at the time of conception. Rock Pharmacy is a full-service pharmacy and drug store. We carry some line of home medical supplies, durable medical equipment, diabetes supplies, vitamins and diet aids. We offer immunizations and we accept all major insurance plans. Rock Pharmacy is a trusted pharmacy that offers prescription delivery services. We would love to get to know you. Please stop by and visit us today. 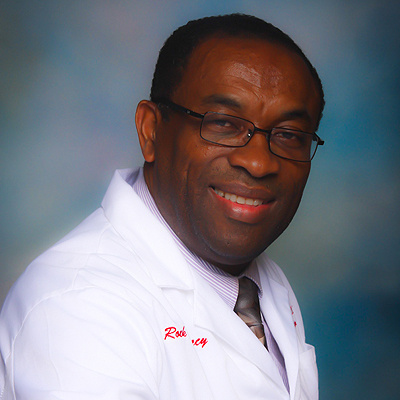 Peter C. Oraekwe, Pharm. D, RPH. Peter's beliefs and values make Rock Pharmacy truly unique. He genuinely cares for his patients, delivering medications to their doorsteps himself, if necessary, to ensure each receives the attention they deserve. His passion is people. He goes out of his way to provide excellent customer service. He strives to put a smile on everyone who walks through his doors. Peter has been in the pharmaceutical industry since 1997 and has been a registered pharmacist since 2001. After following his dream and moving from Nigeria to the United States, he decided to pursue an education in pharmaceuticals. Peter worked his way through pharmacy school while supporting his family with various odd jobs, including a stint as a pharmacy cashier at Eckerd's for two years before joining Walgreens as a pharmacy technician. He graduated as a Doctor of Pharmacy (Pharm.D.) from Texas Southern University in 2001. During his extensive graduate studies, he worked as an intern with the Professional Compounding Corporation of America in Houston (PCCA) for approximately 3 years. Peter helped in developing various flavors for antibiotics both for human and animal use. After obtaining his degree, Peter worked for Walgreens as a pharmacist for 11 years, including 3 years as a pharmacy manager. Peter enjoys the clinical and retail aspects of his practice. He left Walgreens to start his own practice as Rock Pharmacy. His concept of healthcare is rooted in his strong Catholic faith and family values; Peter believes that his patients are an extension of his family. Pharmacy is not just his profession but his vocation; therefore, he goes the extra mile to take care his patients and customers. He has a keen sense of professionalism, care, and humor. He performs his duties with accuracy and a beaming smile. Peter is certified by the American Pharmacists Association (APhA) in immunization and medication therapy monitoring. He has had training as a diabetic educator under the American Association of Diabetes Educators (AADE), and belongs to other various professional bodies such as the American Society of Health-System Pharmacists (ASHP), the National Community Pharmacists Association (NCPA), and the Texas Pharmacy Association (TPA). Peter also earned his IV Certification from UT Austin.